Despite my star-studded Thursday night at the pre-Emmy nominee party for writers at the Academy of Television Arts & Sciences (hello Matt LeBlanc, Julie Bowen, Elisabeth Moss, and cast of Downton Abbey), last week's brush with fame would have sent my mother's heart racing, so I declare Richard Chamberlain as my Celeb Sighting of the Week. The star of such TV classics as The Thorn Birds and Shogun had passed me on the sidewalk, heading to the Starbucks in West Hollywood (the one across the street from 24 Hour Fitness) as I was walking back to my car after a cardio session at said gym. 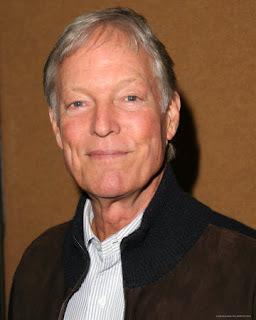 For those of you who still have no clue who I'm talking about, he played Uncle Saul's old flame on Brothers & Sisters last season and assumed the role of Allan Quartermaine in that remake of King Solomon's Mines with Sharon Stone in the 80s. Still don't know? Whatever. My mom will get a kick out of it.